Fashion Week has finally finished, with the after shock still wearing off. I had this brilliant idea that I would blog at the end of each day during fashion week, updating my loyal readers on the ins and outs of the shows with to-the-minute insider images of each show. That idea lasted about 3 hours, up until I realized that with the multiple shows I was juggling each day along with my desperate attempt to uphold my commitment to a quick turn around with sending out images from each show for the fantastic team I was working with, LDJ Productions, there was little time left to spare for anything other than sleep and eat (on the rare occasion). So here I am already one month later, picking up the pieces and still digesting the aftermath. 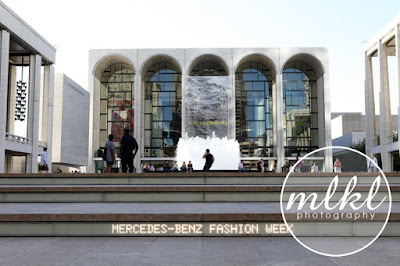 With images from the shows going up on my website nearly every day, mixed in with a mad attempt to stay on top of emails, I'm going to make an attempt to amend my absence and take this time to itemize a brief rundown of the events of Fashion Week. To view images, however, I must direct you to my website where your thirst for all-access images to the internal affairs of fashion week will be more than satiated! Christian Siriano: This Project Runway alum had the mildest of manners. A joy to work with, and with only a few years of experience under his belt, this designer knows how to put on a show. He hires some of the tallest models, by far, most of whom are divas in every sense of the word. Tommy Hilfiger: This outdoor event, held in Herald Square, was Tommy's tribute to New York's Fashion Night Out. It was a sort of installation/presentation, with models set up at three separate car scenes scattered on the grounds at the foot of a stage for a surprise concert by Train. The models made up the status-quo beautiful Hilfiger all-American family... the same models currently seen in the nationwide TH campaign. I made fast friends with the head of Tommy's marketing and the stage managers, so by the time Train arrived I had rubbed enough of the right shoulders to follow them up on stage for some fantastic concert/crowd shots of the evening. Academy of Art University: Rushing from the Hilfiger event to the tents for AAU lent me just enough time to rush through backstage and out to front of house for the show to begin (even with the usual 20 minutes delayed start time), so there's not much news to relay other than that of the numerous senior student designers present there were several I'll be sure to keep a look out for in the years to come. Lela Rose: Lela, Lela, Lela! Leading up to the show the only word anyone could think of to describe her line was "pretty"... and pretty it was indeed! The clothes, the models, the makeup, the hair. Scheduled for a Sunday morning (her consistent time slot year and year again), this designer likes to put on a pleasant show that can be easily digested over a relaxing Sunday brunch afterwards. To add to this aire of ease, weaving between the feet littering backstage, one can pick out Lela's furry canine friend, Stitch! - beloved by many (many, that is, except the security guards who have to constantly keep it from escaping into other shows in nearby tents). The show itself, well, it was so beautiful that I found myself crying, just a little... and then just a little bit more, when post-show I realized I had been so distracted by its beauty I had forgotten that my lens had zooming capabilities! W Hotels Global Glam: A box presentation, this hotel knows how to throw a party! With just 8 models in total, modeling an array of designers, guests mingled through separate stations showcasing the fashion culture of different international homes of the W Hotels. The after party was soon to follow, with one of my all time favourite international recording artist, Roisin Murphy, on the turn tables, and a guest list boasting Denise Richards and Carmen Electra. Rosa Cha: This luxury swimwear specialty line was unknown to me before this season's shows. Perhaps this is because I don't own a 30 foot yacht in the South of France. Perhaps it is because I am terrified of water. Whatever the reason, I am thrilled to have discovered this line - even if it will only ever be purely for aesthetic, as opposed to practical, purposes. This show was my all-around favourite of the season. 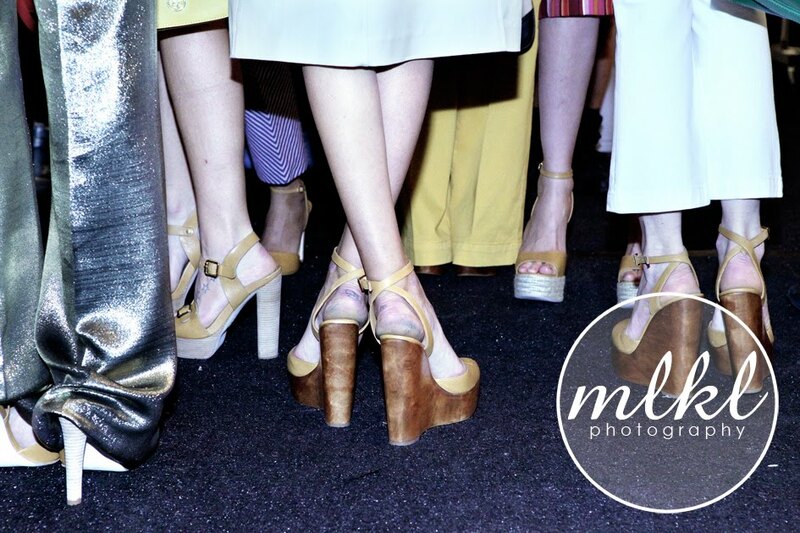 Everything was absolutely stunning: the models, the hair and makeup, the designs, the photographs ;) And it was the only show for which I remained backstage the entire time, thus rendering an exclusive backstage glimpse of what makes a runway show tick. And working with the ever-lovely Chanel Iman wasn't too painful either! Toni Francesc: This was my second season attending this show; a show filled with wearable luxury goodness. Being an avid lover of all things natural, I was thrilled to see the all-wooden sculptural accessories - from tree-trunk "handbags" to dramatic neck collars and, um, rings? This curly-haired creative, hailing from the Spanish metropolis, styled his show with some of the most delicious hair and makeup I've seen all season. Fortunately this season, working with Kelly Cutrone (of Bravo's hit show "Kell on Earth"), was much more calm than in seasons past... no reality tv cameras = much less drama! Anna Sui: Anna wasn't on my original agenda, but I knew from the very start of Fashion Week that I would do everything I could to get in... and I'm so glad I did! 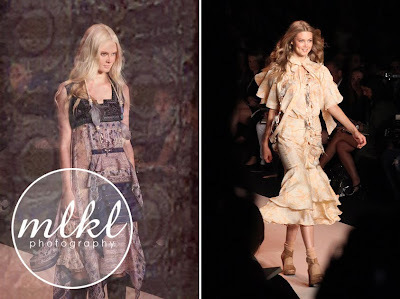 It was a lineup of all the top models, including a few of my favourites: Lily Donaldson, Freja Beha, Abbey Lee Kershaw, and Lindsey Wixson. And the designs! The ever feminine touch of Anna Sui did not disappoint! Tory Burch: This collaborative runway presentation, hosted exclusively by American Express for it's most valued cardholders, showcased Tory Burch designs currently available for purchase this autumn - a clever idea for a credit cardholders event. With the details for the show coming together last minute (quite literally! I didn't even know this show existed until the day before), the entire show, both back stage and front of house, was by far the most relaxed of the season. L.A.M.B. 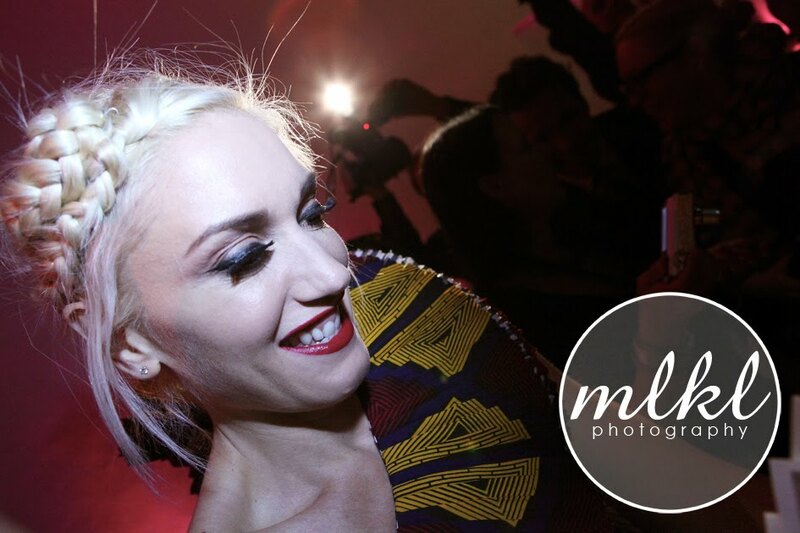 : Gwen Stefani's brain child was the perfect way to finish off the week. This being Gwen's first time debuting her collection on the runway, she spared no expense. With the show running up a bill of $250,000 (and those are only the fees my company was privy to seeing), allocating $50,000 to tent rental and $1400 per model, the show was pure luxury both back stage and front of house. There was an unlimited food spread backstage that dreams are made of. Not to mention the Queen Bee herself... Gwen was an absolute sweet heart. What a relief it was for me to see she, one of my favourite artists in both talent and personal style, had managed to balance stardom with motherhood (famed hubby and Bush frontman, Gavin Rossdale, accompanied their children backstage to show their support), fame with humility, and business with personable-ility. (Yes, I just created a new word!) Her clothing and accessories were flawless - even with one dress still on the fitting mannequin backstage waiting to be sewn together just a few hours before the show! Her shoes were a fatal attraction - boasting 5 inch platform heels on a vinyl runway was in every sense of the word, brave. The $50,000 after party that was to follow, lasted but a couple short hours with Gwen making a cameo for no more than 10 minutes. It was an intimate private event, with guests including top representatives from L'Oreal, Bedhead, and several handpicked editors. With the week finally coming to a close, our fabulous family at LDJ Productions finally took down their hair and celebrated the week's success with impressive, and not-so-impressive, dance moves set to the DJ's tunes of, surprisingly, everything BUT Gwen Stefani.